Mother's Day is next Sunday! I'm sure it's already on your radar but it always has a way of sneaking up on me. 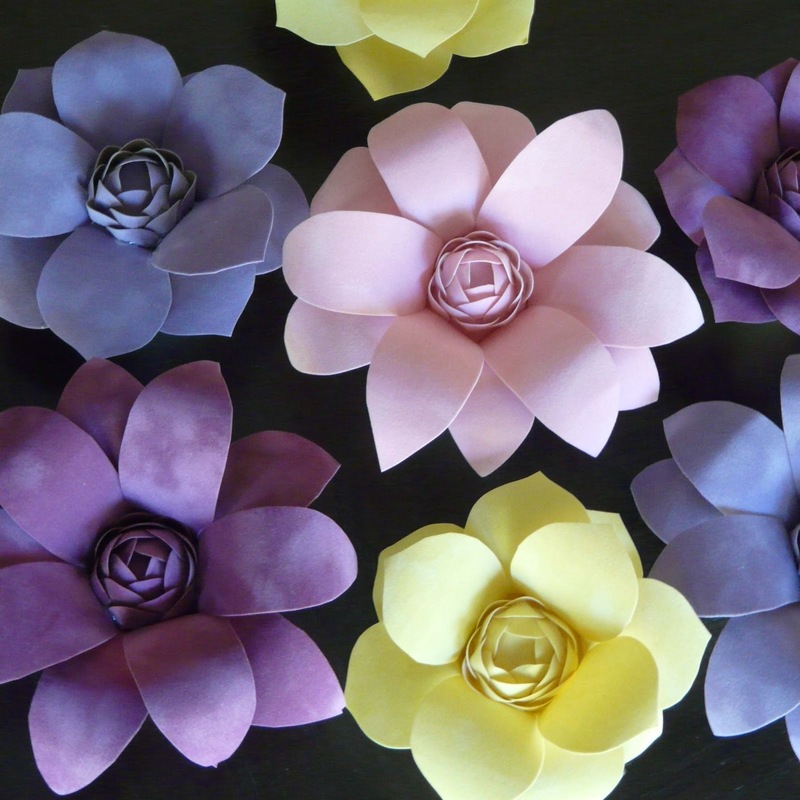 If you're into making things and need tabletop decorations or a gift topper, try these pretty Spring blooms. They'd also be perfect for a bridal shower, girls' birthday party, Teacher Appreciation Day... any event that goes hand-in-hand with flowers. To create the form, I decided to use plastic eggs leftover from Easter. I've used plastic eggs before (for these fabric pinecones), and they're no-fuss and easy to work with. 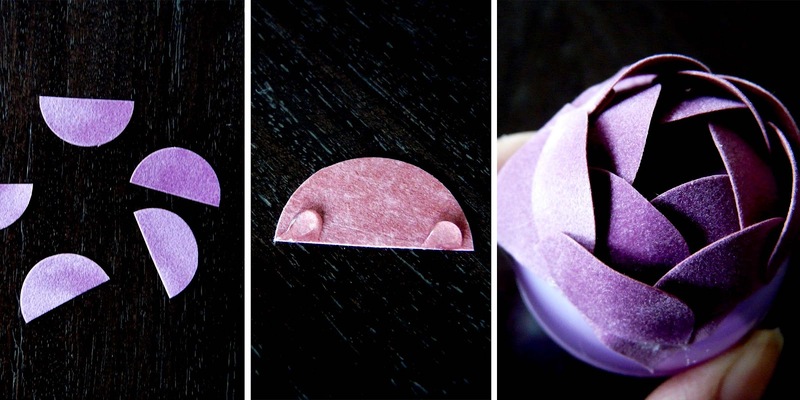 First, cover the bottom (rounded part) of the plastic egg. 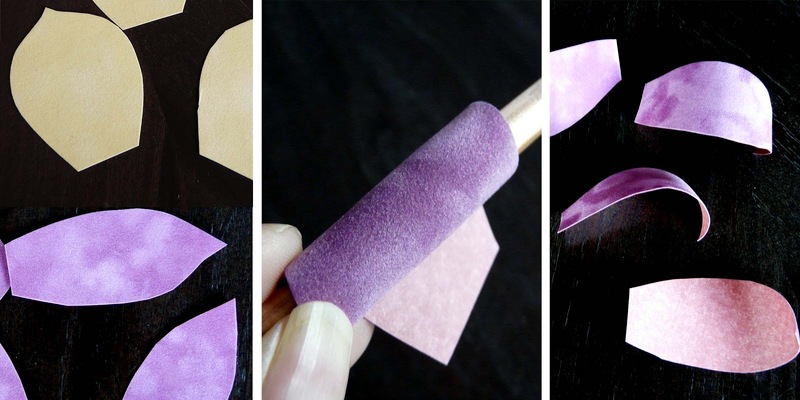 Cut out a 2-inch square from the velvet paper and, using a hot glue gun, attach it to the center. 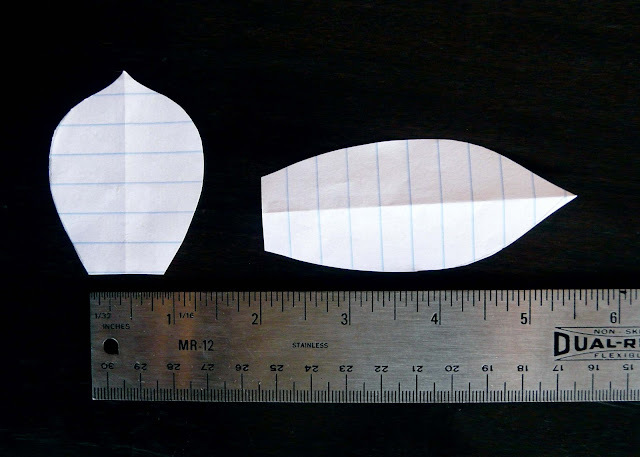 Make 4 cuts and glue down the paper so that the base of the egg is covered. This will become the center of your flower. Now it's time to make the detailed center of the flower. Using a 1-inch circle cutter, cut out 10 circles and then cut them in half into semi-circles. Using a hot glue gun, apply a dab of glue to the corners of the semi-circle. Starting just off center, attach the semi-circle to the egg form. The semi-circle should have a little lift, so glue it down with a small arch. Then move onto the next semi-circle, overlapping and making a small square or pentagon in the center before moving down to the next layer. Stagger each piece so it has a "realistic" look. Do this for all 20 semi-circles. This should cover about 1/3 of the egg. Now it's time to make the petals for the flower. I made my own templates for the petals. There is no set rules for this, but keep the base of the petal at 1-inch or less. Anything larger is harder to attach to the egg. 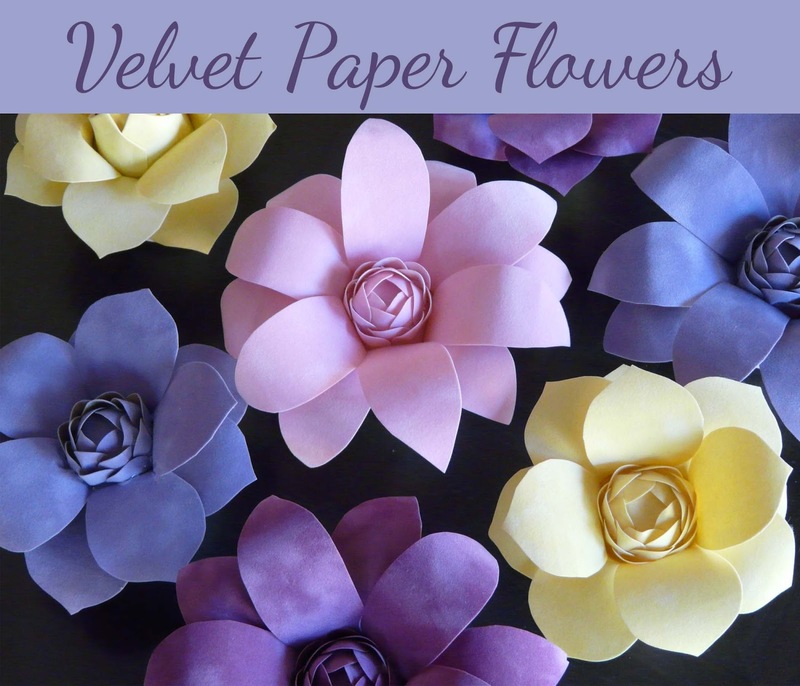 Using your template, cut out your petals from the velvet paper. I used around 10-12 petals per flower. 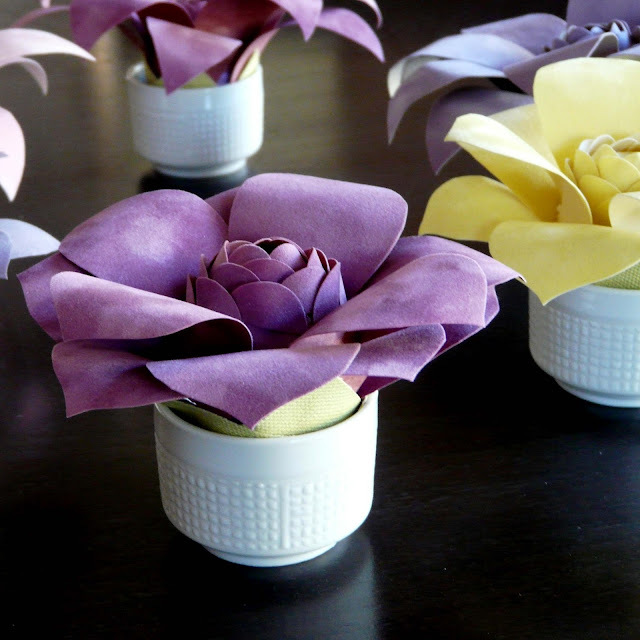 Use the end of a pencil to add a little curl to the petals. 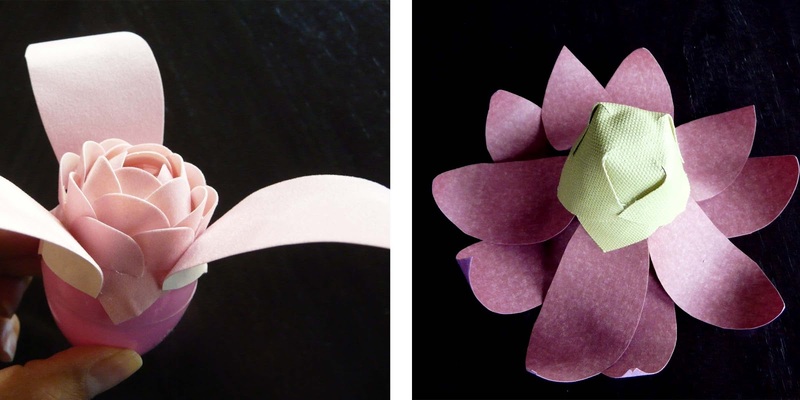 Using a hot glue gun, apply a little glue to the base of the petal and attach it just beneath the center detail. Stagger the petals for a more realistic look. The final step is to cover the base of the flower. Cut out a 3-inch square from the green canvas. 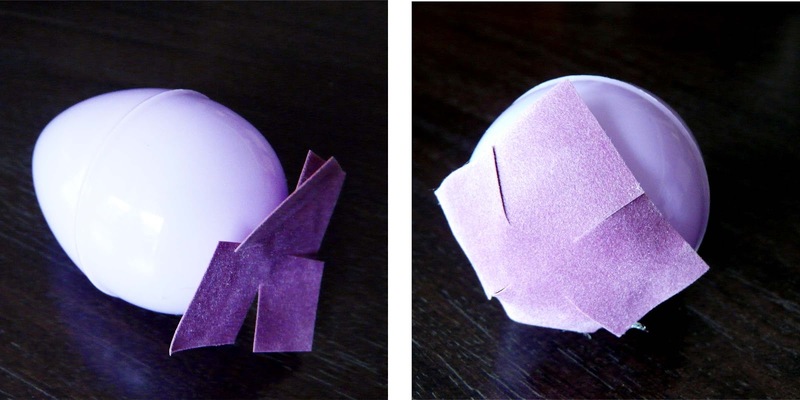 Similar to step one of covering the base of the egg, glue down the center, make four cuts and wrap & glue down the base. The flowers can be displayed in small cups (these are sake cups from World Market) or, if you want them to stand on their own, you can make "feet" using your hot glue gun. The details for the "hot glue feet" are here. You can also attach a stem. The details are here (steps 10-11). Soft and pretty flowers for Spring. SEI provided some materials with which I created the project shown. The written content, photos and opinions expressed are my own.